Home » Expired Contests » Enter to win a COMET TV December Prizepack! Enter to win a COMET TV December Prizepack! Mind on Movies is very excited to announce that we are working with COMET TV on a December GIVEAWAY: Tank Girl Exclusive Swag And Cult Classic Goodness! 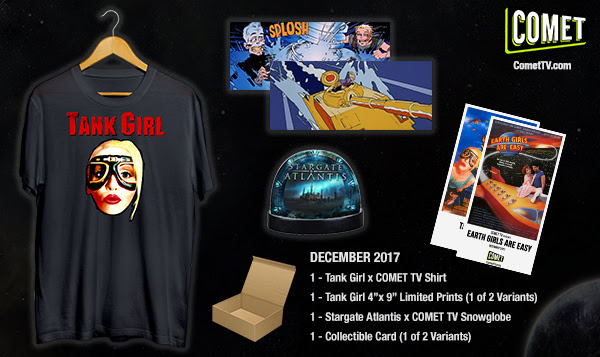 Limited Edition Tank Girl x COMET TV T-shirt, Tank Girl 4"x9" UV Print, Stargate Atlantis x COMET TV SnowGlobe, and a COMET TV Collectable Card.